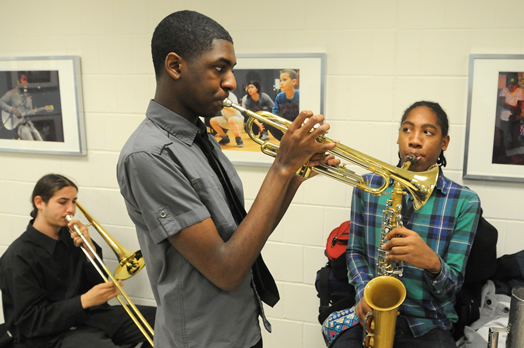 Reaching the next generation of musicians means finding the music that students love and working with it. 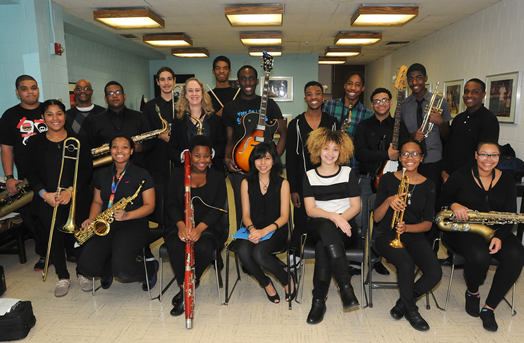 THE NEXT GENERATION: Local 802 member Janet Grice (standing above the bassoonist) teaches music at the Fordham School for the Arts in the Bronx. 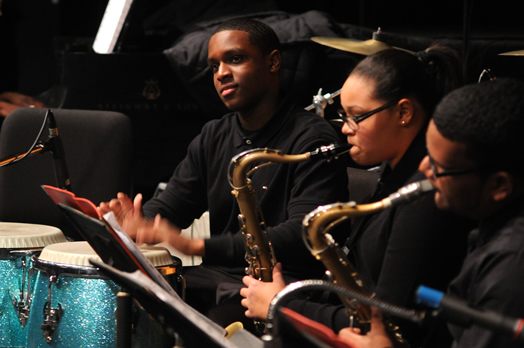 The student musicians in this article were photographed at a recent concert that the Fordham jazz band gave at Lehman College. Photos by Walter Karling. When I read the other articles in this Allegro series on music teachers, I was inspired. I agree with Kevin Blancq in his 2014 article that I love my work, and that it’s a way of giving back the amazing life lessons learned from my teachers, many of whom I never adequately thanked before they left us. Teaching is a relationship built on trust, and in our job we encourage hundreds of young people each day. I also agree with Brian Doherty in his 2012 article that teaching is probably the hardest job I have ever done. Being a band director means spending hours organizing music and inventory, writing lesson plans, assessing students, dealing with teenagers’ emotional and discipline issues, collaborating with school staff, promoting events, communicating with parents, and finally actually teaching music to students, many of whom are beginners and have not played in groups before. I grew up playing in school ensembles in Massachusetts since third grade, where I learned the discipline needed to succeed as a musician. It’s a lot like playing on a sports team, but unfortunately most students where I work have limited access to both organized sports and music programs, so teaching ensemble skills is an important component of my lessons. Learning to play instruments builds coordination and motor skills, but it seems that manipulating complicated mechanical objects such as instruments is a rare activity in our digital age, despite knowing that children learn through hands-on experience and play. My students enjoy working in teams, and music provides the opportunity to develop social skills and face-to-face relationships. My current school, Fordham High School for the Arts, is a multi-discipline arts school of 437 students in the Bronx. When I began teaching there, I was elated to have my own music room and office, good arts studio facilities, adequate instruments and a supportive administration and creative arts team. On my first day, faced with a half-dozen students who claimed they played drums but could not read or play rudiments, I passed out trombones and trumpets and said, “Now you will learn to play a second instrument!” Students were artistically talented but lacked basic training. With many of Dominican, Caribbean and Puerto Rican heritage, they shared my love of Latin rhythms and were open to my musical choices. Students who played gospel music in church already had good harmonic and rhythmic command, and although they excelled on rhythm section instruments and loved to jam, they could not read music. My goal was to channel that energy and bring the band together by teaching kids to play horns, read music and gain familiarity with the big band repertoire. We now have two bands, and students are encouraged to arrange songs they want us to play. I also teach advanced placement music theory. Though the emphasis in what I teach is on performance and technique, becoming a musically literate student involves listening, discussing, critiquing and writing, which I believe leads to development of lifelong learning skills and increased interaction in our global society. Last fall, as I led my high school band in a concert at Lehman College, I remembered my mother, whose birthday was that day. She had been a public school elementary teacher, and she also played a little piano. Her dad was a college professor of education and had dabbled with the trumpet. Though teaching seemed like a natural choice, I resisted it as a profession, choosing to play bassoon and pursue work as a musician instead. At the New England Conservatory I was fortunate to study with bassoonist Stephen Maxym, who played with the Met. I spent a few years freelancing, performing in Europe and Brazil. Upon moving to New York City to earn a master’s at NYU, I began doing union work with my jazz ensembles, mainly with MPTF funding. I also worked under union contracts for jingles and recordings. A particularly memorable gig was leading a tour in the public schools with my woodwind quintet of improvisers for the Grammys in the Schools Foundation. It was not surprising that the children we played for had so little familiarity with our instruments; I had encountered the same bewilderment when playing for adult audiences. I questioned why the general public was so unaware of instrumental music. What finally brought me to teaching? After a year in Brazil with a Fulbright to research music, economic reality hit. I needed to make a steady income, and freelancing just wasn’t cutting it. I had subbed in Boston schools, so I decided to give a try teaching music in NYC. I went to the Board of Education to be fingerprinted and take a test in which I had to play the Star Spangled Banner on the piano. (I have never had to do that since!) Immediately I got a call to cover a maternity leave at a middle school in Brooklyn. Arriving early the next day I was greeted by a grateful principal who informed me that I would be leading the band in their winter concert…in a few minutes! The students arrived dressed in their finest attire. (I have no idea what I was wearing, but was certainly not dressed as a conductor.) Someone handed me the scores. As if in a dream, I gave the downbeat. I learned how to teach on the job and enjoyed working with the students, many of whom were of Russian descent. During the next period in my life, I raised a family and worked as a music teacher in Queens and for the Lincoln Center Institute. Both jobs were protected under a union contract with the UFT. But after a while I felt something was missing. As an itinerate teacher, I didn’t get to know the students, their families or the school community very well. After earning a doctorate and working as an adjunct professor, I also felt disconnected from my students, who I got to know for only a semester before they left. I felt marginalized from the academic community. I wondered if the students absorbed the lessons I taught. What happened to them after our classes ended? Did they continue to attend concerts and explore their creativity through artistic endeavors? Did their schools continue their music programs? Did I have any impact on their institution? Finally, I started teaching in the Bronx about 10 years ago. It was obvious from the start that classical music alone would not grab the attention of these students, who had never played an instrument or attended concerts. So I developed a jazz curriculum for middle and high school students who were beginners but enjoyed Latin jazz and parade music. I learned a lot from my colleagues who were veterans in these schools. I wrote about what I learned in a book called “Blueprint for Teaching and Learning in Music,” published by the NYC Department of Education, where I analzyed the art of teaching the “older beginner,” a type of student who is quite typical in the NYC schools. It became obvious that students were interested in playing catchy melodies with a good groove by ear, but how would I get them to buy into reading music? I chose jazz songs that the students liked, such as “Mambo Inn,” “Picadillo,” “Watermelon Man” and various pop songs. Motivated to learn the songs and play together, my students were eager to read the notes on the page as quickly as possible. The truth is that music literacy can be taught using any musical language, and as teachers we need to choose the music we love, since we live it daily. We can impart that love to our students. 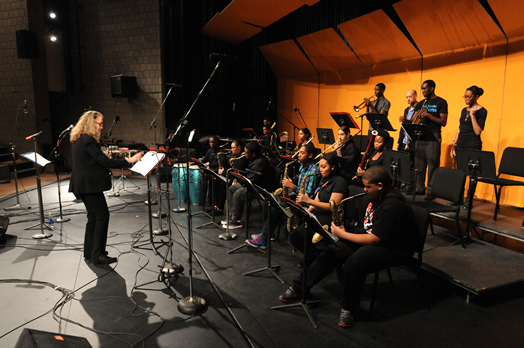 With the support of organizations such as the Ensemble ACJW, Lehman College, NYSSMA, the Grammy Foundation and Jazz at Lincoln Center, my students have attended and performed throughout New York City, learning what it takes to present a concert from start to finish. In class they use notation software and recording technology. In 2013, my students recorded a full-length CD in a studio at Lehman College. They composed rap lyrics and original songs, and gained awareness of careers in the music industry. Resources such as Donors Choose, Mr. Holland’s Opus and Young Audiences help maintain our inventory, and fellow musicians have presented master classes. Parents and staff have also helped. They say it takes a village to raise a child, and I would say the same about training a musician. Many of the goals of education in today’s world are things we naturally do as music teachers, such as reading, writing, discussing, analyzing, critiquing and creating. As teachers we are expected to meet the Common Core Learning Standards through activities that develop higher-order thinking skills in our students. As music teachers we need to be able to articulate what we do and how we do it, and to advocate for music education, because unfortunately it is undervalued in today’s educational climate. 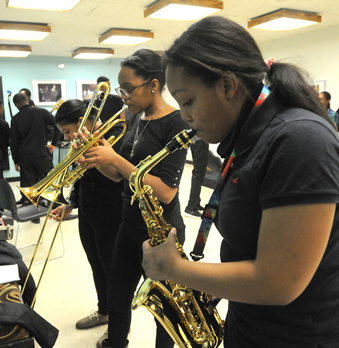 While many students won’t continue to play beyond high school, they are gaining appreciation of quality repertoire and an understanding of live music performance that non-performers never experience. Not only are we training students to be informed audiences for the future of music, but we are also training them to be creative and motivated lifelong learners. After all the hard work, there’s nothing like standing in front of a band of teens playing with their hearts and souls, feeling that energy come back to you. There is never a dull moment in a day at school, and in fact, the students keep me laughing (or crying!) as we play, talk about, listen to, and create music. The open secret is that as teachers, we learn from our students and continue to grow as musicians. March is women’s History Month, and that brings up the question of how does being female impact teaching music? I have to admit, I had no female band directors in high school or college, and most of the conductors and teachers who mentored me were male. That seems strange, given that the bands I grew up playing in had equal numbers of girls and boys. In the school where I teach, only about a fifth of the band members are girls, but when I began there seven years ago, there were none in the band. Though the girls take on leadership roles and responsibilities, they are more reserved about improvising, and don’t jam with the boys outside of class. On the other hand, the choir is mostly girls! Though times have changed since I was a teen, when there were few female role models among instrumentalists, today’s popular music features band instruments even less, and most female musicians in the media are singers. I can’t say that being female makes it more difficult to sustain a career in music, because it’s a challenge for anyone, male or female. As a bassoonist, there are fewer playing opportunities anyway, so I found myself being entrepreneurial about music rather than competing for gigs. That being said, I believe there is a need to encourage girls to play instruments, because it is a fun, empowering, social and creative way to experience the heart of music.